Norwegian gamblers looking for a new pass time need look no further than the brand new Folkeautomaten casino. The casino primarily offers members games from NetEnt but there are also titles from Evolution Gaming, Microgaming, Play’n Go, Playtech and Yggdrasil Gaming available. As such members will find a vast collection of slots, card and table games, video poker, scratch cards, bingo games, arcade games and more. Furthermore, there is an extensive live casino on offer and a number of progressive jackpot games. Best of all, a large number of games can be enjoyed on mobile devices. 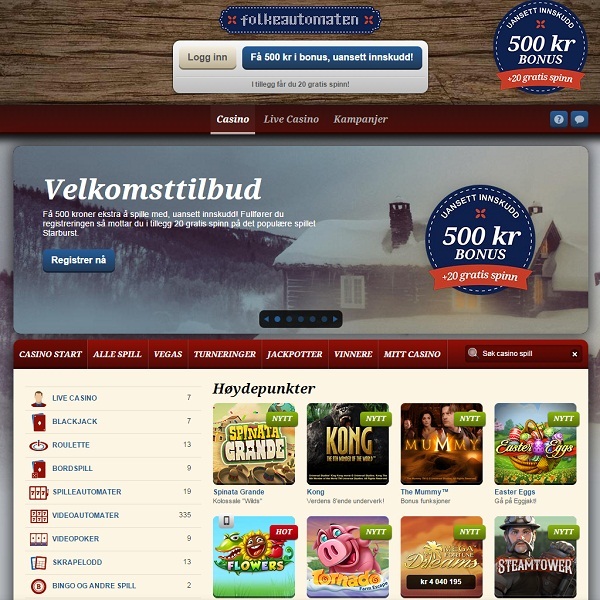 New members at the casino can receive a 500KR bonus just for signing up together with 20 free spins on Starburst slot. There are then a number of exciting promotions to take part in as well as a hugely rewarding loyalty scheme.